One week from now, we'll be watching team finals, for which I will be taking off. I am very excited! So here is the second half of my list. I love her routine, as much as everyone else hates it, I love it. I love the music, it matches her faith as my dad informed me, and although the presentation isn't at the level of some of the other routines, she knocks it out of the park with the tumbling. That first pass is breath-taking, and it's hard to be more innovative on one pass. In case you couldn't tell by my tweets, I love this gymnast so much! She is another first year senior who I think got jipped out of experience, but she has mostly made up for it this year. Part of my love for her is because I saw her at American Cup, my sister automatically loved her, and my love hit a little later watching her bars dismount and floor. I really hope she sticks around four more years! This team has come so far in such a little amount of time. Bellu and Bitang have made a huge difference in Romanian Gymnastics, I'm sure Romanians are glad they came back. It has been a hard 8 years for Romania, and while I want them at the top, I really want the Americans to win a little more, just as this is the best team they have ever fielded. 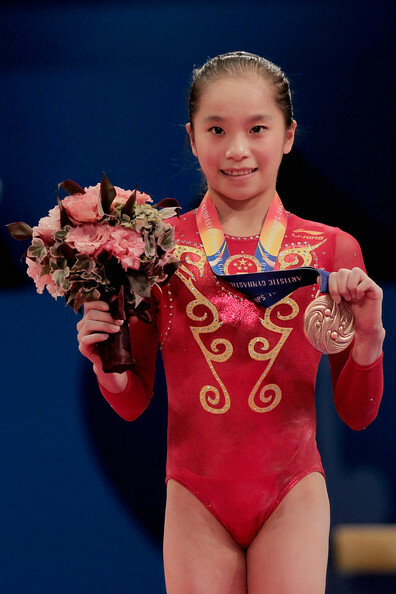 Yao was the bronze medalist in 2011, with a fall in the third rotation! She is such a fierce competitor, and very powerful, especially for a Chinese gymnast. This year, however, many bloggers and fans have counted Yao out for the medal race. I disagree. She'll be the one to capitalize on mistakes and take a medal when no one is looking. I think this team is awesome. I wish that Peng Peng hadn't injured herself, same with Taila, but I think that they have a shot at making Team Finals. This is a very strong team all around, and it would be awesome to see them in the finals! Also, I need this for my 2 fantasy teams! In 2004, she was the queen of the games, winning half of the gold medals! In her return, her beam has still shined, and she placed 7, but can look to improving that this year, as she won the beam final at Euros. I really want her to show the world that she is still the most amazing beam worker in the world, even if she doesn't win, I just want her to kill it! That is all for my list, let me know what your wish list is!